(Nanowerk News) At the Niels Bohr Institute, University of Copenhagen, researchers have realized the swap of electron spins between distant quantum dots. The discovery brings us a step closer to future applications of quantum information, as the tiny dots have to leave enough room on the microchip for delicate control electrodes. The distance between the dots has now become big enough for integration with traditional microelectronics and perhaps, a future quantum computer. 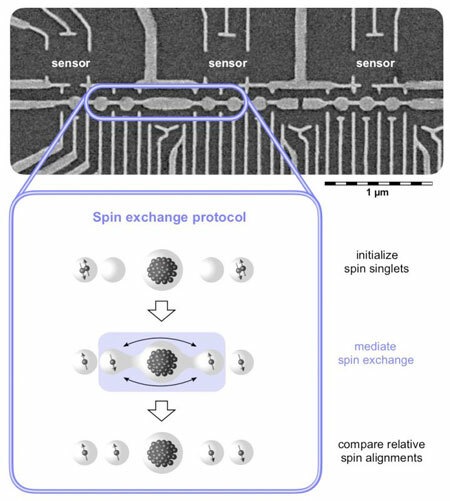 The result is achieved via a multinational collaboration with Purdue University and the University of Sydney, Australia, now published in Nature Communications ("Fast spin exchange across a multielectron mediator"). Normally, the left and right dots in the linear array of quantum dots (Illustration 1) are too far apart to exchange quantum information with each other. Frederico Martins, postdoc at UNSW, Sydney, Australia, explains: "We encode quantum information in the electrons' spin states, which have the desirable property that they don't interact much with the noisy environment, making them useful as robust and long-lived quantum memories. But when you want to actively process quantum information, the lack of interaction is counterproductive – because now you want the spins to interact!" What to do? You can't have both long lived information and information exchange - or so it seems. "We discovered that by placing a large, elongated quantum dot between the left dots and right dots, it can mediate a coherent swap of spin states, within a billionth of a second, without ever moving electrons out of their dots. In other words, we now have both fast interaction and the necessary space for the pulsed gate electrodes ", says Ferdinand Kuemmeth, associate professor at the Niels Bohr Institute. Overall, the demonstration of fast spin exchange constitutes not only a remarkable scientific and technical achievement, but may have profound implications for the architecture of solid-state quantum computers. The reason is the distance: "If spins between non-neighboring qubits can be controllably exchanged, this will allow the realization of networks in which the increased qubit-qubit connectivity translates into a significantly increased computational quantum volume", predicts Kuemmeth.